What is more, a very beautiful tradition takes place this day (in Catalonia this is huge), men buy roses and women books as presents to celebrate it. On this day, one of the best writers in human history was born, Cervantes, accordingly, a literary prize is handed over. Similarly, the most important cities usually have a book fair during the month of April. 23th of April is called San Jorge in my region, Aragon, and Sant Jordi in Catalonia. (Jorge and Jordi stand for George in English). Arturo Pérez Reverte is one of the best writers in Spain. As we are in April I have bought a book, this book is the newest Arturo Pérez Reverte has published. The title of this book is “Los perros duros no bailan” something like “Tough dogs do not dance”. As you can guess, this book has dogs as protagonists. Martin Scorsese is my favorite filmmaker. Stanley Kubrick is the best ever, he is so big that rests in heaven. Francis Ford Coppola is also a genius, his first movies are insuperable. However, I prefer Martin Scorsese as I feel I can relate to him more easily. Indeed, he comes from a humble background and he makes movies for the sake of doing art. If Martin Scorsese presents a movie, Halcombe will watch it for sure. One of the movies I have taken into consideration to write my fictional novel is Goodfellas. I really like the character of Joe Pesci. Joe Pesci won an Oscar because of this movie. As a matter of fact, I pay homage to this movie throughout the book. If you want to know more, read the novel!! Spanish railway system is amongst the best in the world. 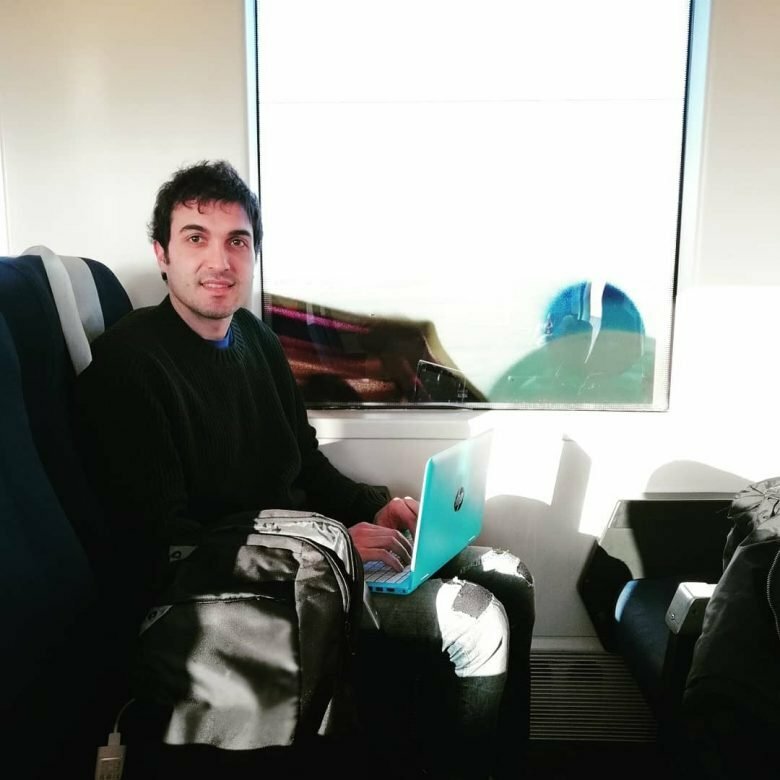 Sometimes I take a train from Tudela (Navarra) to Zaragoza (Aragon) as state company Renfe treats customers perfectly. Whilst I enjoy a beautiful landscape during a pleasant trip I write articles on my laptop as the picture depicts. Another Spanish region, Castilla y León, also has its official day on this day, 23rd of April. Men usually buy red roses. Nice! I love the movie 2010! Good luck on the car!